Design: Stylised landscape. Fabric : Silk. BUGATTI IN OTHER CORNER. ORIGINAL LIBERTY OF LONDON- MADE IN ENGLAND 100% SILK SCARF. HAS LIBERTY OF LONDON WOVEN INTO 1 CORNER. Fringed, it is in an excellent condition. ART DECO TRUE VINTAGE 20s 30s SILK SCARF NOVELTY CUBED BIRDS RARE. Very unusual novelty vintage 1920’s/1930’s in very good vintage condition. Black silk with stylised geometric birds in shades of lemon, blue, cream and green set against a black background with ‘faux’ painted tassels. Scarf measures 35”/89cm x 32”/81cm. Only condition issue is very slight fray on one corner as pictured but this is very slight. Please message me if you have any questions, thank you for looking. 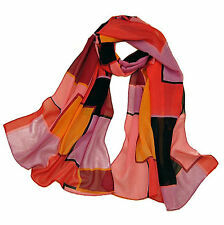 This is a beautiful 1970's art deco scarf all the way from Paris. Vintage RETRO scarf PSYCHEDELIC design 60TS MOD RETRO SCOOTER INDIE polyester. Orange and red. Photos taken with flash and in natural light. Vintage Beautiful Italian Polyester Machine washable 25.5 X 25.5 inch Multi Vibrant Scarf. Very Good Vintage Condition Good Gift! Please see photos for condition and details Any questions please ask Thanks for viewing. 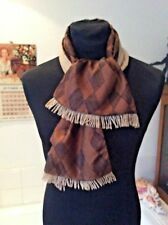 Art Deco c.1930 Neckscarf or large Handkerchief. very rare & unusual. (The beautiful hand-printed burgundy & white spotted style are an eye catching yet sophisticated pattern & colour combination with the signature Turnbull & Asser motif clear to see. dry cleaning label still attached). Ladies fashionable silky, smooth and stylish long scarf. Comfortable, silky smooth and warm. trendy dog bone pendant, Silver pear drop pendant, cube & single stone pendant, Locket, hearts & Keys. Length 110 cm. Fur is silky soft and beautiful. colour also depend on setting of your monitor. I cannot be responsible for your monitour settings or size fitting. SQUARE PAISLEY Scarf/Cravat VINTAGE 60TS MOD RETRO SCOOTER INDIE green. WOOL. Photos taken with flash and in natural light. 2 Spelt - Body & Tails. Can be inserted into inner slit. Colours may also appear slightly different depending on your PC / Phone / Tablet / Laptop monitor and lighting conditions used in our setting. This scarf oozes quality and has an embroidered RW monogram, is edged with a silk fringe and probably dates from around 1920. There a few tiny brown marks but very so small they can be hardly noticed. 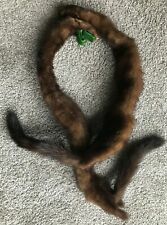 Animal Type Fox or Mink ?. Genuine Animal Fur Color in a Brown and White Mottled Pattern with a Decorative Button Closure. Era Mid Century Modern Mod. Fur Type Fox. Material Fur. Uses Removable Detachable Coat Jacket Sweater Collar. Fabric: Soft open weave wool with woven rectangles and fine silver thread stripe. Fabric: Soft open weave wool. The edges are hand rolled and machine stitched and are in excellent condition. The silk is without any distress, age marks or shattering and is in near original condition as it’s remained unused.